Sugar & caffeine free. For everyday use. Feel energised - contains 7 B vitamins to help release your energy. Supports mental performance - contains vitamin B5 which contributes to mental performance. 1. Helps you feel energised: the vitamin B1 and B2 in Berocca work with your body to naturally release energy from your food. 2. Reduces tiredness and fatigue: the vitamin B3, B6 and magnesium in Berocca help reduce your tiredness and fatigue. 3. Supports mental performance: vitamin B5 contributes to your mental performance. Suitable for: vegetarians & vegans. What's all the fizz about? Life's busy and hectic - be ready with Berocca! Start every day with Berocca... a specially tailored formula containing all 8 B vitamins, which are scientifically proven to work with your mind & body to support your energy & mental performance - setting you up for the day ahead How can Berocca help you stay on top form? Helps you feel Energised: Contains 7 B vitamins, including B1 & B2, which work with your body to naturally generate energy from your food Reduces Tiredness & Fatigue: Contains 6 B vitamins, including B6 & B12, & magnesium to help reduce your tiredness & fatigue. Supports your Mental Performance: Contains vitamin B5 which contributes to your mental performance Did you know? B vitamins are water soluble so they're harder for your body to store - so luckily not only is it absolutely fine to glug down a Berocca every day - we heartily recommend it! 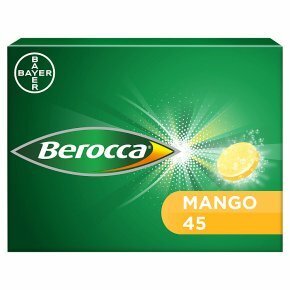 Berocca Mango Energy Vitamin 45 Tablets Berocca tablets are packed full of vitamins and minerals. Berocca contains all eight B vitamins - the vitamin B complex. This includes vitamin B1and B2 to help naturally release energy. Vitamin C, B3, B5 and B12 as well as magnesium each helps reduce tiredness to keep you on top form every single day. B vitamins are water soluble so they're harder for your body to store. Luckily it's absolutely fine to glug down a Berocca every day - we recommend it! Keep product and empty tube out of the sight and reach of young children<br><br>Need to know<br>Contains only 7 calories (7kcal) per tablet<br>Berocca can be taken every day throughout the year, but should not be used to replace a well-balanced diet and healthy lifestyle.<br>Do not exceed the recommended daily dose<br>Not recommended if you are pregnant or breast feeding<br>Not suitable for people with kidney problems<br>Do not swallow or chew the tablets, they're designed to be dissolved in water.